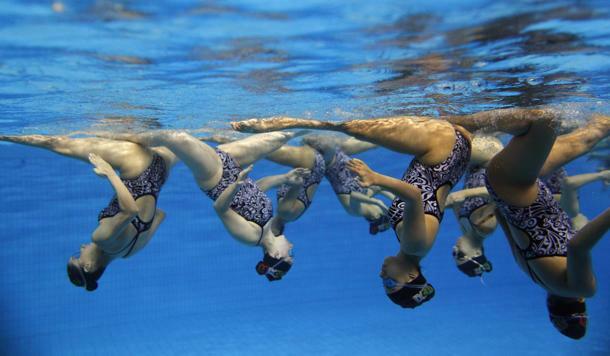 The big mystery of synchronized swimming is how the swimmers keep time with the music when they're underwater. They actually rely on the same system as dolphin trainers, and on something Homeland Security uses to communicate with divers. A tiny underwater speaker system creates smaller-than-normal sound vibrations, which carry better in water. The 8½-inch speakers deliver the same amount of sound as roughly 20 coil-based speakers because they utilize piezoelectricity to apply current to ceramic. But that's not the only way swimmers stay in time. Kristin Walton, a personal trainer from Sacramento who has competed for 15 years, said that despite months of practice to get the timing down, underwater communication is essential. Swimmers do this by "beeping" -- essentially screaming with their mouths shut by vibrating their vocal cords. "There's a lot of communication that goes on underwater, from counting to pattern changes to sometimes having to move a teammate if they are in the wrong spot," she said. Another oddity of the sport is the swimmers' reliance on a box of Knox gelatin, which is similar to Jell-O. For those who have wondered how their slicked buns and styles stay immobile even when they're immersed in water, the clear flavorless gelatin is the secret formula. Walton said swimmers will tie up a ponytail on the crown of their heads and then use a paint brush to apply the Knox, which has to be dissolved in boiling water before use. Knox is better for the hair than anything chemical-based, but it does take 30 minutes to an hour to wash it out. Usually there is an area at the competition site to boil the gelatin, but Walton said that sometimes swimmers, especially when competing early in the day, will show up already "Knoxed," having applied it the night before. When the swimmers appear outside the pool, they sport layers of makeup, lipstick, mascara and glitter, for an exaggerated look. "The brighter, the better, in order for crowds and judges to be able to see your expression from far away," Walton said. "The way you do your makeup can give more of an overall artistic look to your routine."